Tim, The Forester Artist, Ivy Smith, and I were at the Shasta Wildlife Rescue and Rehabilitation Run for the Wild fund-raiser over the weekend. We had a lot of fun talking with kids and signing books. Of course we all posed for a picture. Unbeknownst to us, our T-shirts spelled out a message all their own! 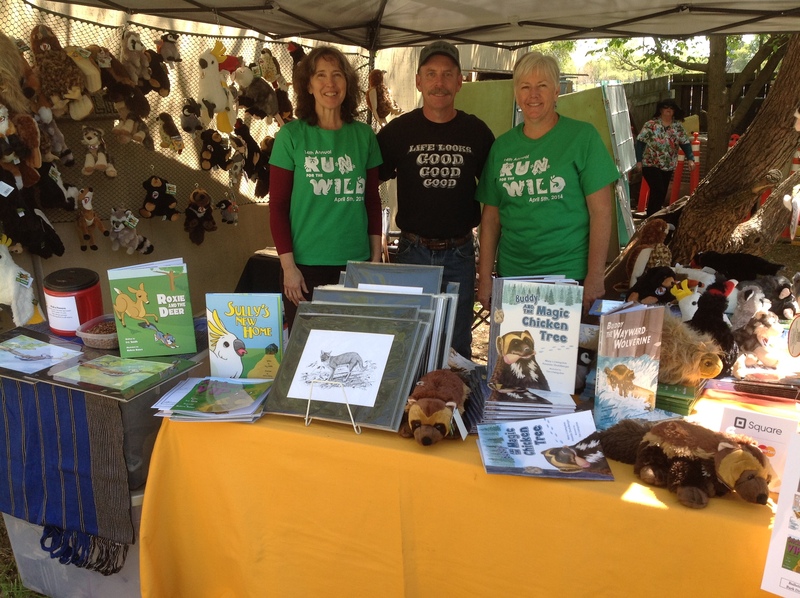 Shasta Wildlife Rescue’s Run for the Wild was a great success, so life looks, good, good, good! What, not what you thought? Mary A Livingston, Tim Livingston and Ivy Smith all donate time to raise funds for Shasta Wildlife Rescue. This entry was posted in Uncategorized and tagged book signings, funny t-shirts, Shasta Wildlife Rescue by MaryALivingston. Bookmark the permalink. Sounds like a great cause. Glad you had fun. Thanks for sharing a photo from the event. Shasta Wildlife Rescue does a great job rehabilitating and releasing. Funny enough, my first introduction to the group involved a turkey vulture, mad hens, and vomit…vulture vomit. Awe, thanks. We have a shot from earlier in the day, with all of us wearing event shirts. The multiple layers were a bit warm, so as we wrapped up, Tim\removed his event shirt. It wasn’t until I checked the photos that I found the funny T-shirt messages. Ivy and I had a good laugh, and Tim’s always a sport! it’s always great to see images of both of you – always happy and smiling your way through life! You need to make some T-shirts with your book characters! What a great cause – wonderful to see the books together.